On the Green nine, the closing hole features a lake all the way down the left with huge bunkers on the right to catch those who shy too far away from the water. A closing birdie might just be possible here if a cautious three-shot approach strategy is taken to a green that’s tucked into an amphitheatre setting. England’s Bronte Law certainly feels at home at Amelkis Golf Club. She won the Lalla Aicha Tour School in December 2018 with a new Ladies European Tour record score of 26 under par for five rounds which included nine consecutive birdies in round three. We played the mature Blue & Red courses as Green is a bit green! Very good layout good par 3’s and the 15 hole is a good par 5 index 1 where you need to hit fairway off the tee. Nice setting where the flatness of the surrounding landscape is well balanced with nice elevation changes on the course. Excellent greens whilst good choices off the different tee-boxes. Wide course lots of space with a lot of waste areas where we found there was little difference between the sand in the bunkers and the waste areas which contrasted with the course we played the day before. Could do with some 200 meters markers to help navigation as the map on the card was unreadable. This course has a fairly new look to it, and appears to be still settling in, especially so on the green loop of nine holes at this pleasant 27 hole complex. The blue and red loops look much more established and are more interesting in terms of design. Some might say the red loop is the most challenging and picturesque but the blue loop has many of the most interesting design features. 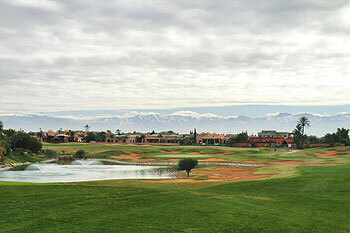 It takes you away from the clubhouse directly towards stunning views of the Atlas mountains which can be seen in winter due to a lack of heat haze. The flat desert land has obviously had much earth movement to give form and definition and this is most obvious on the blue nine. The first hole is fairly ordinary but gives a gentle introduction. 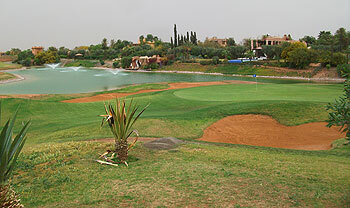 The next par five is of good length and like many of the holes in Marrakech is well bunkered around the green. From the fourth onwards, the difficulty level ramps up significantly. The tee shot on this par four needs to go far enough to give a realistic shot at the green but short enough to avoid being kicked off the pronounced mounding and into the water hazard short right. Not finishing on the fairway entails a severe side hill lie for a nervy approach. The fifth is probably the least desert-like hole, in that it is the only hole on the course that is visibly uphill, to a plateau green followed the most pronounced dogleg at the entire 27 hole complex on the 6th with water tight to the green. The 8th is a charming par three that requires a precise iron much in the mould of the 3rd but the two standout holes are the 7th and 9th. Both have significant areas of hard (grit, not sand) wasteland where one might expect fairway grass. In a desert climate, these waste areas make sense as they reduce the need for irrigation water. However, more than that the waste areas force the golfer into a decision on the tee: play short or attempt the carry. In an era when distance is all too easy to come by, these design kinks compel even the long-hitting golfer to make decisions, rather than blast away. Finishing on the hardpan leaves the choice of taking an unplayable or testing the scratch resistance finish on your iron. The par 5 9th on the blue nine has two such areas, but in this case the first area can be used to sneak some extra distance. After playing the blue loop the perfect accompaniment is the red loop. Water is present on three holes: the 4th, 6th and 9th where its presence is far from ceremonial. The mounding on the first three holes is somehow more appealing and strategic than on the blue nine. The 4th demands a carry over water for any shot aimed at the green. With a front pin, a safe shot to the rear of the green results in a long putt slightly downhill with a considerable swale making a bogey not too unpalatable considering the alternative of putting into the hazard. The 6th is even more heavily defended by water to the right of the fairway and again short of the green. Distance is a clear advantage on both the 6th and 7th. The 8th offers a more cerebral challenge with a precise short iron required to find the most opportune spot to attack the hole on an amply contoured raised green. The 9th on the red loop is fairly straightforward until the approach which is troubled by water lurking to the right. The green loop is surely the newest and least established. The lower level of conditioning does detract slightly from the appeal of this loop. It is also more of a straightforward ‘grip it and rip it’ design until the 6th tee. The water hazard is a threat for the entire length of this dogleg right par 4 as it is again on the 9th which like the other two loops closes with a par five. Time may help the green loop settle in, but the blue/red combination is likely to remain the strongest and most enjoyable 18 holes of golf at Amelkis. I played the older Red nine and the newer Green nine at Amelkis, enjoying the former a lot more than the latter, mainly because the Red’s greater maturity gives it a lovely “lived in” feel. The terrain is pretty flat around the property so many of the contours are man-made with little swales and mounds shaped around many of the greensites. Highlight of the round for me was the crazy par five 6th on the Red where you have no idea of what’s to come when playing a blind drive off the tee. The hole then drops down to the right, skirting a big lake around which the fairway wraps itself before reaching a sand-protected elevated green on the other side. Our caddies (which are mandatory, but very reasonably priced at Amelkis) told us the palatial house that overlooks the water on the other side of this hole is owned by Madame L’Oreal, the 89 year heiress of the cosmetic empire who’s reputed to be one of the richest women in the world. It was tough to play the Green nine because of the three club wind that gradually got up but I enjoyed the short par four 6th and long par five 9th which both played around lakes – though that may have as much to do with the fact that they were the only two holes I managed to par on that stormy circuit! If the Blue nine plays anything like the Red then I’d advise golfers to play that original 18-hole course if they only have time for one round as the Green nine are still very much bedding in, particularly if you stray from the fairway into rutted ground. It’ll be interesting to see if the 4th nine gets developed here as that’ll be another indication of just how well Marrakech is coping with the ever increasing numbers of visiting golfers.